Dear Prosecutor, Public Defender, Ambassador, Secretary and Jury Members of the International Buddhist Ethics Committee (IBEC) and Buddhist Tribunal on Human Rights (BTHR), regarding Case 25-2017 against "Ashwaghosh Buddhists Foundation Nagpur (India) & Jeewak Welfare Society ", on January 14, 2018, it is hereby recorded that the trial of the Committee has been concluded to analyze the violation of Buddhist Ethics by the accused. After analyzing the presentation of the Case and the validation of the evidence, the Committee has proceeded with the voting of 7 members of the Jury, confirming that there were 1 vote of “Innocent” and 6 votes of "Responsible" for "Ashwaghosh Buddhists Foundation Nagpur (India) & Jeewak Welfare Society" for the crimes of Complicity with Spiritual Fraud and False Buddhism. In addition, there is an aggravating circumstance since the accused has breached a Conciliation Agreement, which constitutes an act of Violation of Buddhist Law. When interpreting and giving voice to the Jury members' vote, it is concluded that "Ashwaghosh Buddhists Foundation Nagpur (India) & Jeewak Welfare Society" does not have any valid excuse to reward criminals and fraudsters who attempt against the dignity of Buddhist Spirituality. In addition, the accused has stated to the International Buddhist Ethics Committee that Buddhism and the Law of India prohibit annuling prizes previously granted, which is a perjury and an absolute lie, being a new Violation of Buddhist Law. In this sense, it is perceived that a possible economic background or handout would be the only possible reason to explain why the accused has decided to keep maintaining a spiritual prize to a scammer who violates and attempts against the sacredness of the Buddhist Spirituality and who also dishonors the memory of Ambedkar. In this way, this Judgment teaches "Ashwaghosh Buddhists Foundation Nagpur (India) & Jeewak Welfare Society" that should comply not only with the ethical precepts of Buddhist Spirituality, but also with the jurisprudence established by the International Buddhist Ethics Committee, because when this does not happen there are consequences (karma). The proofs of the Case have shown that "Ashwaghosh Buddhists Foundation Nagpur (India) & Jeewak Welfare Society" is within the framework of illegality after failing to comply with the judgments, requirements and conciliatory agreements issued by the International Buddhist Ethics Committee. However, if the defendant eventually came to publicly apologize and remedy the damage caused, by canceling the award granted to the scammer Ronald Lloyd Spencer, then a post-sentencing reconciliation agreement would have been achieved, and any charges against the accused could eventually be annulled. Until this happens, the International Buddhist Ethics Committee declares that "Ashwaghosh Buddhists Foundation Nagpur (India) & Jeewak Welfare Society" is Responsible for Complicity with Spiritual Fraud and False Buddhism, and Violation of Buddhist Law. On the other hand, it is hereby put on record that the United Buddhist Nations Organization will not accept the institutional membership previously requested by the accused. In accordance with Ambedkar, the Maitriyana fights for justice understood as liberty, equality and fraternity between all human beings, promoting the development of a society based on righteous and adequate relationships. Thus, the Buddhist Law seeks the existence of justice in all fields of life, proposing a political, economic, cultural and environmental system that becomes the foundation of a new empathic civilization. This implies an attempt to evade fraud and falsehood that are present in those who have selfishness, dualism and consumerism, which are evils supported by the Ego, Ideology and the State. In this way, the Maitriyana teaches that in order to establish and maintain justice in the world, both the individual and society has to practice contemplation-in-detachment, wisdom-in-compassion and ethics-in-humanitarianism, because without the virtues of benevolence and purification there is no possibility of bringing justice to the world. However, this passion for justice that Buddhist Law has is not actually a new pathway, but it is intrinsic to human nature. Precisely, both the spiritual communities (sanghas) of the past and the current Maitriyana movement have been ways for self-realization of justice in the world. Since its creation 2,600 years ago, the Buddhist Law has been invoking a communitarian justice that self-transcends the illusory differences between castes, social classes and creeds. This obviously requires a libertarian attitude in the face of tyranny and mundane Power. Just as Ambedkar defined justice as liberty, equality and fraternity, the Maitriyana defines it as the transmission of Detachment, Truth and Love, which requires protecting the intrinsic dignity of life and simultaneously fighting against greed, hatred and deceit. In this sense, the Buddhist Law teaches to create just and harmonious social relations, but simultaneously teaches to combat fraud, scam and the lies of the rich and powerful who think they have more dignity than those who are poor and oppressed. In the same way as Sartre, the Maitriyana recognizes the principle that Liberation is always synonymous with Responsibility, criticizing those who, in the name of Liberty, resort to the extremes of debauchery and complacency in the face of crime and injustice which obviously betray the Purpose (Dharma) of Buddhist Law. Therefore, the Maitriyana is the maximum protector of justice and human rights, fulfilling the unfinished goals of Ambedkar in his democratic and socialist struggle against injustice, exploitation and inhuman treatment by those who produce war, poverty, ignorance and pollution. In short, the Buddhist Law seeks to liberate humanity from suffering caused by greed, aversion and manipulation, seeking to alleviate people's needs and also protect them from abuses. If justice is liberty, equality and fraternity, if justice is righteous and appropriate relationships, then justice could never tolerate lies, fraud and falsehood. Taking advantage of its independence and autonomy from States, the Maitriyana is heading legal and constitutional courts that fight against discrimination and degradation, thus requiring both individuals and organizations to comply with the duty of Righteousness. 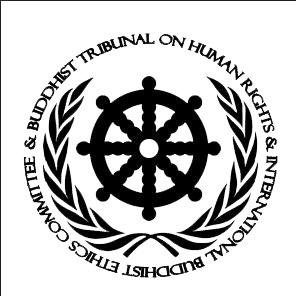 In conclusion, the International Buddhist Ethics Committee has the Purpose (Dharma) that Buddhist Spirituality remains pure and is never perverted or infiltrated by fraudsters and corrupt people, having the duty to denounce and cancel any award to those who commit such serious and unpunished crimes. Therefore, it is established that "Ashwaghosh Buddhists Foundation Nagpur (India) & Jeewak Welfare Society" is violating the Buddhist Ethics by means revalidating the figure of Ronald Lloyd Spencer, who is Responsible for participating in acts of Spiritual Fraud and False Buddhism. Undoubtedly, each spiritual commune (Sangha) has the right to reward those who it wishes, but simultaneously have the duty not to violate the Buddhist Law and the ethical precepts. Thus, the case on "Ashwaghosh Buddhists Foundation Nagpur (India) & Jeewak Welfare Society" is a great teaching for the accused to learn to correct its mistakes, not to support criminals and remain free of bribes or gifts that corrupt integrity and Sacredness of Spirituality. Following the Path of Master Gautama Buddha, who created and developed a spiritual commune (Sangha) of righteousness two thousand six hundred years ago that immediately resolved all kind of infractions, the International Buddhist Ethics Committee oversees that the spiritual communities (Sanghas) of all the world do not attack or betray the purity of Spirituality, so that "Ashwaghosh Buddhists Foundation Nagpur (India) & Jeewak Welfare Society" has been sentenced as Responsible for Violation of Buddhist Law and Complicity with Spiritual Fraud and False Buddhism.